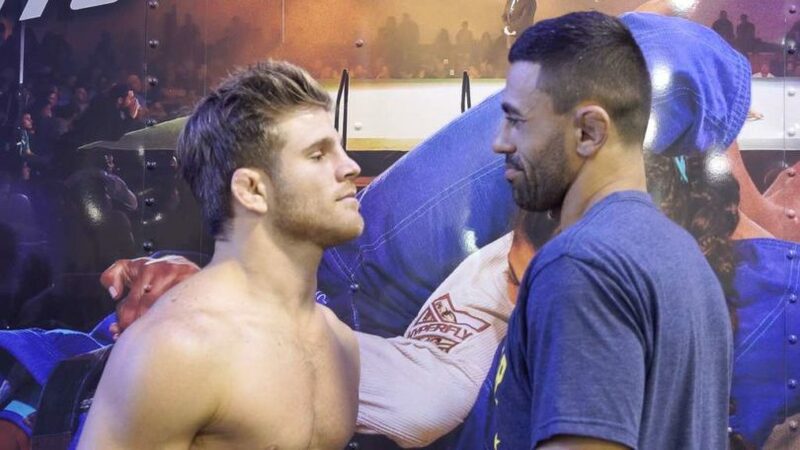 After their heated debate on the Inside BJJ podcast and their intense stare down at weigh ins, AJ Agazarm and Vagner Rocha finally get to settle their differences on the mat. The hotly anticipated match did not disappoint last night as the heated grudge match reached boiling point when Vagner Rocha almost got. himself DQ’d. At one point in the match Wagner, aggressively grabbed Agazarms head, in a grip exchange, which some think looked hard enough to be an actual strike. When AJ got up and disengaged from the match Wagner, then decided to kick AJ off the stage in 300 “This is Sparta” style, sending him hurtling into the crowd. Fight To Win promoter Seth Daniels took to the stage to calm matters down, later posting to Facebook that he wasn’t prepared to DQ Rocha on the basis that he did not want to deny AJ the match, and that Rocha would have been DQ’s under normal circumstances. Rocha was declared winner via unanimous decision. Agazarm was visibly upset, typically played along to his heel role by inciting the crowd to drown out Rocha’s post-match interviews with boos. Agazarm’s Gracie Barra coaches nearly became involved in an altercation with promoter Seth Daniels following the end of the event, displeased at the result and how the match was handled. It looks like there’s still bad blood between Rocha and Agazarm, so here’s to fight number 3! Polaris Pro 5 Location Revealed?